“I came across this little precious kitten a week ago and I am just broken hearted over her. She came to us loaded with fleas and worms. We have been trying so hard to help her but her poor little eye is ulcerated and I think it has popped. We live on a fixed income but would love to help and keep her. She is so playful and loving and has just stole our hearts but I am in fear of waking up to a dead baby. A veterinary clinic recommended I get ahold of you. Please help out little Sooki. Thank you for your time. – Cari”. 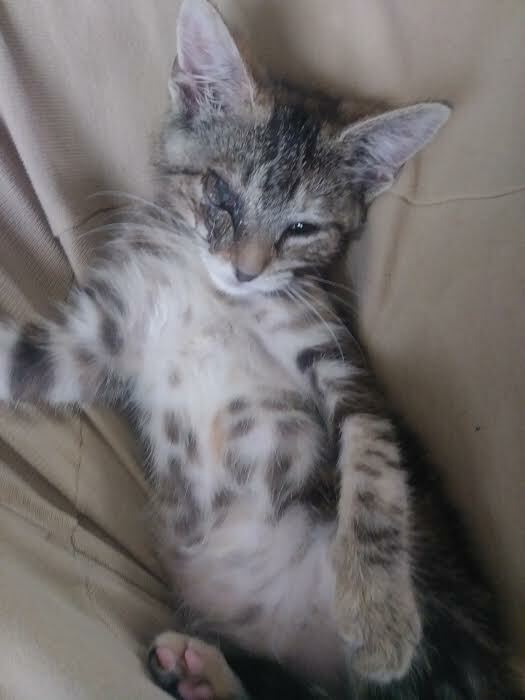 Sooki’s eye was removed and she is now home with her new forever family. She is doing great and purring up a storm. She will still need to be spayed but the doctor didn’t want to put her through too much at once. REMEMBER – Without your donations, we couldn’t give the abandoned and abused that second chance at life.